The entry fee for 9 Hole Youth Tournaments is $10.00; for those youths competing 18 Holes, entry is $15.00. This includes green fees, tournament fees, and LUNCH!! 1. ONE WEEK BEFORE EACH TOURNAMENT, CALL THE TOURNAMENT SITE TO SIGN UP. 2. DOWNLOAD, PRINT, AND BRING YOUR ENTRY FORM WITH YOU ON THE DAY OF THE TOURNAMENT. Click HERE to OPEN the entry form, then print it. 3. CALL THE TOURNAMENT SITE THE NIGHT BEFORE, BUT AFTER 5PM, TO FIND OUT YOUR TEE TIME. Play will be governed by the USGA Rules of Golf, as modified by local rules set by the rules committee. Example: “pick, clean, and place” due to a wet course. 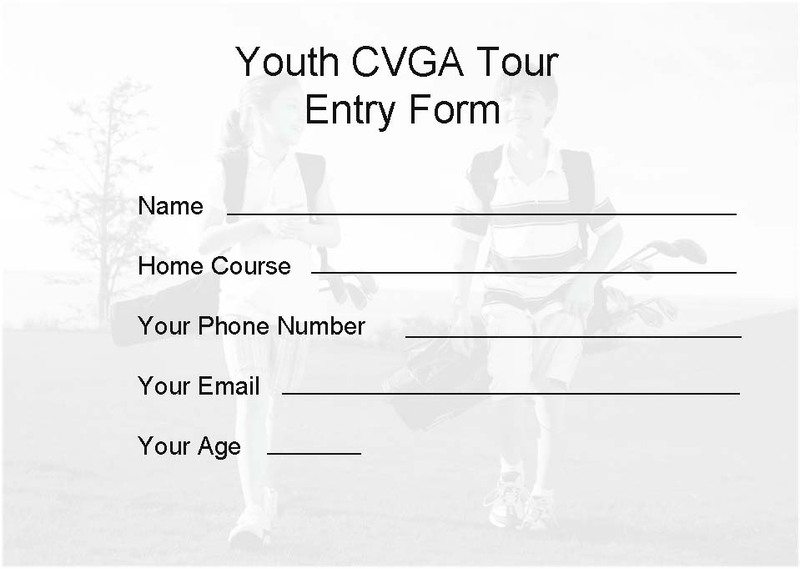 CVGA Youth tournaments are open to all boys and girls under the age of 18 (or the summer of HS graduation). Our tournaments consist of 4 age brackets: 11 and under, 12-13, 14-15, 16-18. Boys and Girls are also in separate divisions. If you have any questions about eligibility please contact the tournament director or tournament site. Entries will be accepted at the tournament site on the day of the tournament at the registration desk. Entry fees for the tournaments are $10.00 for players playing 9 holes (13 and under), and $15.00 for players playing 18 holes. All entries fees include: free lunch, tournament fees, greens fees, and prizes. We ask that all player call the host golf course to set up their tee times and reserve their spot in the tournament at least a week in advance to give the tournament site an appropriate amount of time to set up our tournament in accordance with their tee sheets. Any entry for CVGA that is received after the stated deadline will be accepted if space is available at the discretion of the host course. Participants must adhere to the host club’s dress code. In addition, jeans, short-shorts, cut-offs, gym-shorts, tank tops, T-shirts or swimwear are not permitted. Spectators are not encouraged to ride in carts, unless the host course allows it. Parents are encouraged to walk with our younger groups to help with scoring as well as making sure the players are playing according to the rules. In CVGA competitions a player may obtain distance information by using a device that measures distance only. If, during a round, a player uses a distance-measuring device that is designed to gauge or measure other conditions that might affect his play (e.g., gradient, wind-speed, temperature, etc. ), the player is in breach of Rule 14-3, for which the penalty is disqualification, regardless of whether any such additional functions are actually used. Use of cell phones, pagers, beepers and the like will not be allowed unless it is for an emergency. Violation of this prohibition will result in a warning; continued violation shall result in a disqualification. Competition is deemed closed when prizes are awarded, or in the absence of a prize ceremony, when all scores have been approved by the committee. The CVGA has no control over the condition of a golf course or weather. The CVGA requests from each club that it provide a course in good condition. If the event is played, there will be no refunds granted due to course condition and/or inclement weather.